The La Famille Express and kiteboarder in the Turks and Caicos. The famous La Famille Express shipwreck in the Turks and Caicos. 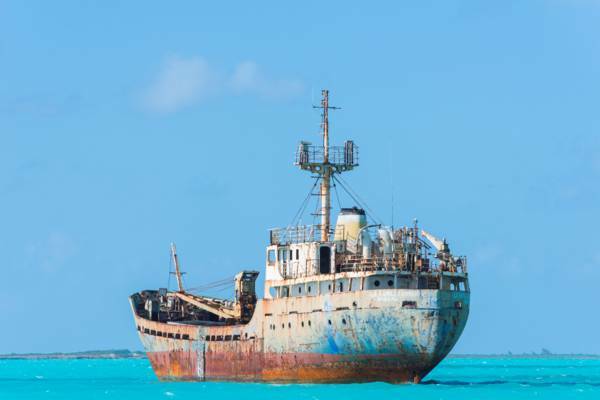 The La Famille Express is a grounded shipwreck and popular landmark near the island of Providenciales in the Turks and Caicos. It’s located about two miles (3.2km) off of Long Bay Beach on the southeast side of the island. How Did the La Famille Express Get There? The history of the La Famille Express began in 1953 and in a much colder environment – the Soviet Union. The vessel started life as an oil rig service ship, transferring supplies to remote offshore oil wells. At its initial lunch, the ship was christened the Форт-Шевченко, or Fort Shevenko in English, after the military port town in the Caspian Sea. The La Famille Express's anchor. Decades later in 1992, the Fort Shevenko was decommissioned. For about ten years, the ship saw various uses in the Baltic area, and then became the maritime La Famille Express under the Panama flag in 1999, and served as a regional freighter ship in the Caribbean. At this point in its life, the La Famille Express was in poor condition and being used to transport bulk rock, not something that a valued freighter ship would be used for. 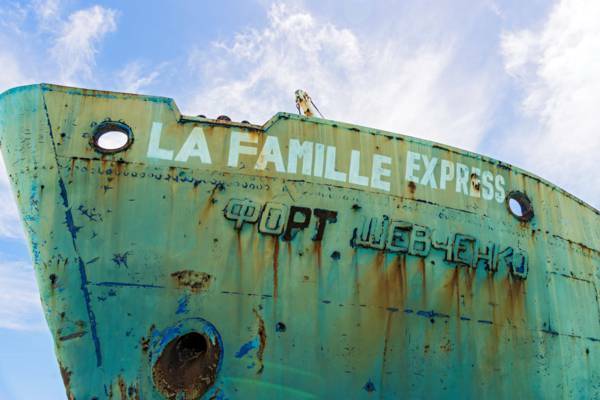 The La Famille Express became firmly planted in the shallow waters of the Caicos Banks during Hurricane Frances in 2004. Under the high winds, the unmanned vessel had actually dragged its anchor from the South Dock area of Providenciales, a distance of almost 12 miles (19km). This anchor is still in the water near the ship. The bow of the La Famille Express with the Fort Shevenko name. As the La Famille Express is found two miles offshore, it’s too far to wade or swim out to. The vessel is farther out than it looks. Most visits are by boat cruise or jet ski, and the ship is a popular stop of charters that visit the south side of Providenciales. Kiteboarders, launching from the unparalleled kite spot of Long Bay Beach, do often make the journey out. Proficient kayakers and stand up paddle boarders also sometimes paddle out, but casual paddlers will find the trip difficult. It’s important to be aware of the hazards and dangers of climbing on and boarding the La Famille Express. 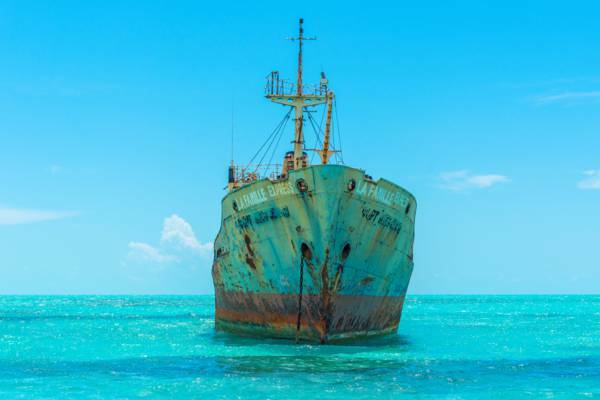 Steel vessels decay rapidly in a tropical marine environment, and this landmark is no exception. A rope net hangs over the side, but we highly advise against boarding the ship. Dangerous holes in the hull and deck are found across the ship, razor sharp metal shards and broken glass abound, and there’s ample amounts of hazardous dust and particles from the old paints, iron oxide, synthetics and petroleum products. Boaters nearby should also take caution, as jagged bits of metal can be found in the area. The bow of the La Famille Express in the crystal clear waters of the Caicos Banks. The Turks and Caicos archipelago, like the Bahamas and Bermuda, claimed a great number of ships over the last few centuries. Many of these vessels have completely disappeared, yet there are a few still out there that make for interesting sites to visit. One similar yet smaller ship is the Erzulie Transport stuck in the mangroves on the south coast of North Caicos. Due to its location in the very shallow Caicos Banks, this hulk is typically only seen by visitors on bonefishing trips. A shipwreck that is probably seen by even more visitors than the La Famille Express is the Mega One Triton on the picturesque Governor's Beach on Grand Turk. This vessel was also grounded on the beach during a storm, Hurricane Sandy in 2012. Another wreck with an interesting origin was the River Arc. This freighter suddenly appeared one morning on the barrier reef off Whitby Beach on North Caicos. The ship was deserted and the generator was running. It was likely a drug running vessel that was abandoned. Today, only a small portion of the bow remains above the waterline. Last (and definitely least!) is the tiny Invincible freighter near Molasses Reef and West Caicos. 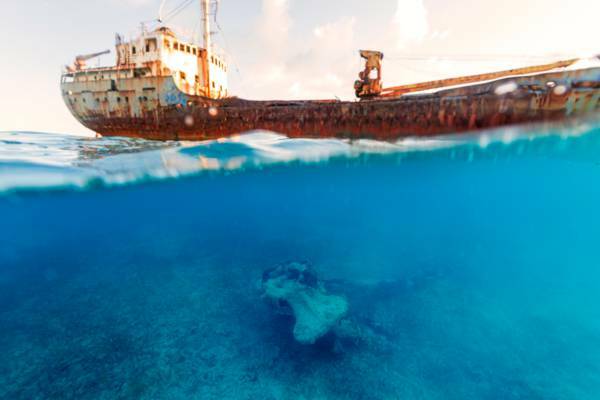 This wreck sits on a shallow reef and shoal, and supports a large number of sea birds. Last reviewed by an editor on 15 October 2018.